Dave Arnold specialises in fishing the top end of Muriwai Beach into the Kaipara Harbour. On Saturday April 20, in extremely light winds (2 to 4 knots) that defeated most kitefishers on the day, he managed an excellent catch of snapper. He uses a custom made rig designed specifically for maximum power and safety. It is a 100 kg dropper rig with a 100kg kiteline powered by a Mega Mouth Kite and Large Skyhook in light winds, and a Power Chute Kite or Delta Force in stronger winds. He says the rig is nearly impossible to pull in without leather gloves. When he needs more pull (which obviously isn't often with the assortment of huge kites he uses) he attaches a large plastic rubbish bag to the kiteline. Dave tears the rubbish bag and fits it so it fills like a spinnaker. While it does pull the kite down a bit, Dave swears by the method for beating the 4 to 5 knot rips he fishes in at the mouth of the Kaipara Harbour. On Saturday Dave fished the outgoing tide at the South Kaipara Head with the Mega Mouth Kite and Skyhook. There was only a slight swell. Using a mixture of salted mullet, bonito and fresh just caught kahawai Dave and his mates cleaned up. They wound up catching over 50 snapper up to 3 kg, 3 kahawai (one of which was used immediately for bait) and 1 gurnard. Dave is a firm believer in releasing anything under 35 cm so many of their snapper were released unharmed. Dave is confident that he could have fished even if the winds were lighter by using the rubbish bag spinnaker. Bruce Gunner also managed to get his Kite Longline out off Muriwai Beach in the flukey winds on Saturday. We have known Bruce for years as he bought one of the first Paul's Fishing Kites Rigs ever made and has been kitefishing at Muriwai Beach for 14 years. On Saturday using a Delta Force Kite rigged with a shopping bag drogue and a skyhook he set 25 hooks baited with salted mullet and kahawai twice for 18 snapper up to 4kg and nine very large gurnard. He swapped six of his gurnard for half a dozen mullet with a sucessful mullet fisherman he met on the beach. Bruce also fished in the better winds on Sunday and caught another 15 snapper and eight gurnard plus a few kahwai using the fresh mullet from the previous day for bait. 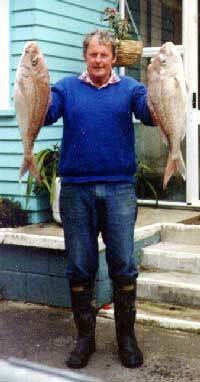 File fish picture Bruce with two Muriwai snapper he caught in 1992. Paul Morris, while fishing a boat longline fitted with Target Hooks from his kayak last Saturday, discovered a new spot of foul out from Browns Bay in about 17 feet of water. He set his gear just on dusk using whole pilchards for bait. In order to avoid any chance of getting snagged, he underweighted the hook section to allow it to float up a little off the bottom. Paul landed 15 snapper around 1 to 2 kg and all were caught in the lip. As he was packing up to head home he noticed a couple of guys boat fishing close to where he had set his gear but they weren't having much success at all. Paul, being the helpful kind of guy that he is, paddled over to them and gave one of the guys one of his Target hooks to try out and showed him how to bait it. Well their luck soon changed, or at least it changed for one of them. Paul watched as two good sized snapper were pulled in by the chap fishing with the Target hook. Frank is a veteran kitefisher who has fished a bottom longline rig for about 10 years. While fishing Glinks Gully on Sunday April 21 Frank and 3 other keen fishers ran two sets of 25 hooks. The first set resulted in 18 snapper and 1 gurnard and you would think it doesn't get much better than this, that is until you pull in your second set of 25 hooks with 23 snapper in tow. Frank was using frozen kahawai bait which he had caught on a previous kitefishing trip. Also fishing Glinks Gully, Robbie Cullen ran three sets with his bottom longline rig on Tuesday April 23. The winds were screaming Nor'easterlies, the line was wailing, and his Super Kite sat like a dot in the sky according to Robbie. His first set was let out to around 800 metres offshore without much luck, but his second and third sets he ran out to between 1200 and 1400 metres offshore where he caught a total of 20 snapper up to 2 kg and 2 good sized gurnard. Robbie was using a combination of mullet and kahawai baits which he caught himself and prepared for the freezer. After scaling and filleting the baits and cutting into large strips, he covers the baits with rock salt and a generous helping of tuna oil. The baits are then left to soak for 6 hours in the fridge before freezing. Robbie reckons these baits will last for months, the flesh is just as firm and translucent as when it had just been caught, and works like magic on the longlines. There is no way the crabs can get this bait off the hooks says Robbie. I've just returned from another great day of fishing with my kites. Monday 22nd April, with the Golden Years Fishing Club, we managed to catch a total of 13 fish including four nice snapper. Today 23rd April, my wife and I caught 18 fish including 10 excellent snapper. All were caught on the West Coast, not far from Helensville. Your web site is one of the best I've seen and I always take the time to look at it as soon as the email arrives. Hi, Last weekend was very still in the wind department hence no Kites or Kontikis could get out. One or two surfcasters were on the beach. Our local fishing club held a ladies and childrens fishing contest for the end of the year. The ones that attended enjoyed the fishing day with about 5 smallish snapper being caught. Our commercial cray fishers are still not having much to show for a days work so it looks like the cray's could be late again this year. At night out at sea a lot of lights are on so the big factory ships are out there chasing the tuna.